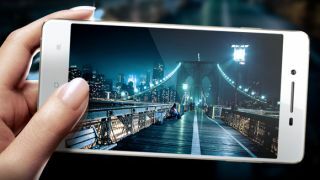 Chinese phone maker Oppo Electronics is at it again, unveiling its second new smartphone to be announced this month. The Oppo R1 was made official with a listing on the company's Chinese-language site, and though it's less impressive than the phone Oppo teased earlier in December it still has plenty to like. That earlier phone was the Oppo Find 7, a smartphone with a 2K-resolution display that may even beat Samsung's Galaxy S5 onto shelves. The new R1 is not even full HD, with a 5-inch display coming in at 1280 x 720. But it's still an impressive mid-range handset. Details about the R1 reportedly leaked before, but today Oppo made it official. The phone's most notable feature is its 8-megapixel rear camera, which packs a more than decent F/2.0 aperture. Other than that the R1 is pretty standard, with a 5-megapixel front camera, a 1.3GHz quad-core Mediatek processor, 1GB of RAM, 16GB of storage (with no expansion options unfortunately), and a 2,410mAh battery. The R1 also runs Oppo's Color modification for Android 4.2: Jelly Bean. So far the Oppo R1 is only slated for release in China. Its price translates to roughly $410 (about £250, AU$458), though whether the R1 will ever see any official releases outside of China is anyone's guess. Need to do any last-minute shopping? Refer to TechRadar's holiday gift guide for all your tech- and game-gifting needs!